For other people named Kenneth Mackay, see Kenneth MacKay. Kenneth Hood "Buddy" MacKay Jr. (born March 22, 1933) is an American politician and diplomat from Florida. A Democrat, he was briefly the 42nd Governor of Florida following the death of Lawton Chiles on December 12, 1998. During his long public service career he was also a state legislator, a U.S. Representative, lieutenant governor, and special envoy of President Bill Clinton's administration for the Americas. As of 2019, he is the last Democrat to serve as Governor of Florida. MacKay was born to a citrus-farming family in Ocala, Florida, the son of Julia Elizabeth (Farnum) and Kenneth Hood MacKay, Sr. He served in the United States Air Force during the 1950s, and then attended the University of Florida, where he was tapped into Florida Blue Key and eventually received a law degree. MacKay was inducted into the University of Florida Hall of Fame (the most prestigious honor a student can receive from UF). He married Anne Selph in 1960; the couple has four sons. MacKay was elected to the Florida House of Representatives in 1968, and to the Florida Senate in 1975. From 1983 to 1989 he served for three terms in the United States House of Representatives. In 1988 he received the Democratic nomination for the United States Senate, but lost in a very close race for that office to Connie Mack III. MacKay won the 1990 Democratic primary for lieutenant governor on the ticket headed by former U.S. Senator Lawton Chiles, who had held the Senate seat MacKay had unsuccessfully sought two years earlier. They won the election and were re-elected in 1994, the latter campaign being a close contest against the Republican ticket headed by Jeb Bush. As lieutenant governor, MacKay was given many duties and played a very important role in Chiles' cabinet, including being co-chair of the Florida Commission on Education, Reform and Accountability. He was regarded as the most significant and powerful lieutenant governor in Florida's history. MacKay was a strong supporter of the use of capital punishment, as Chiles was. When he was asked during the 1998 gubernatorial election campaign about his positions on use of the death penalty and electric chair in Florida, he replied: "I support the death penalty and support the use of the electric chair so long as it operates in a reliable fashion." However he suggested that Florida should change its mode of execution after Pedro Medina's botched execution, saying: "The last thing we want to do is generate sympathy for these killers." In 1998 MacKay sought to succeed the term-limited Chiles as governor, easily winning the Democratic nomination with his full support (Chiles and MacKay were known for their friendly relationship). However, MacKay was soundly defeated by Republican nominee Jeb Bush, who had narrowly lost the 1994 contest following controversial push-polling by his opposition. Despite his defeat, MacKay became Chiles' successor when Chiles died unexpectedly on December 12, 1998. MacKay was at this time in Boston with his wife. When they returned to their hotel room, they found a message about Chiles' death, asking MacKay to get on a plane to Atlanta, where they were picked up by a state crew and flown through thick fog to Tallahassee. At 12.30 a.m. the next day, the 65-year-old MacKay was sworn in as Florida's 42nd governor at his Capitol office for the 23 days remaining in Chiles' term. "There's no great pleasure in this," said MacKay about taking a job he had sought, but got for a short time after his political partner's death. He also stated how sorry he was that he would be unable because of the short time and lack of mandate to take care of such issues as education and health care. Despite keeping a low public profile during his time as governor, MacKay made at least 56 appointments to various boards and to various offices, including two judgeships. He granted six pardons to female prisoners and was involved in such issues as the negotiation plan for the Everglades, and moderated some other disputes. Perhaps his most visible act as governor was signing Peggy Quince's nomination to the Florida Supreme Court. Quince was Chiles' last pick for the bench and it fell to MacKay, and then Bush, to sustain her nomination. MacKay was succeeded by Bush on January 5, 1999. After his governorship ended, MacKay retired from active politics. He, however, remains publicly active. He was appointed by President Clinton as a special envoy for the Americas, being the second person to hold this position. During his tenure he traveled to 26 countries in the Americas, working on issues such as the Free Trade Area of the Americas (FTAA), the North American Free Trade Agreement (NAFTA), the Caribbean Basin Initiative (CBI), hemispheric security, strengthening the rule of law, labor standards, environmental policies and human rights. 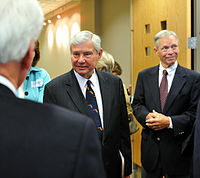 He attended a “Day with Florida Governors” symposium, organized by the University of Central Florida and Louis Frey Institute on March 27, 2006 with Governor Bush and former governors Claude Roy Kirk Jr., Reubin Askew, Bob Graham and Bob Martinez (Wayne Mixson, who served for three days after Graham's resignation, wasn’t present). MacKay's memoir about his political career, How Florida Happened, was published by the University Press of Florida in March 2010. Source: Our Campaigns – Candidate – Kenneth "Buddy" MacKay Jr.
^ "Julia Farnum MacKay — Ocala, Fla". ^ Florida, State Library and Archives of. "Lieutenant Governor Kenneth Hood (Buddy) MacKay and his wife Anne Selph MacKay". Florida Memory. ^ a b "State: MacKay steps into awkward 23 days". ^ "**Election '98: The road to November**". ^ "WORLD Magazine - Today's News, Christian Views". ^ Dunkelberger, Lloyd (1 January 1999). "MacKay Term Short But Active". The Gainesville Sun. pp. 1B, 5B. Wikimedia Commons has media related to Buddy MacKay. This page was last edited on 11 February 2019, at 12:54 (UTC).